Vantelin Supports Reviews: Do They Work? Vantelin supports are popular in Japan, but have only achieved limited success marketing to consumers in the United States. Finding consistent information on the product is difficult. Ultimately, if you believe athletic tape and/or compression wear works, then you will probably find some benefit to Vantelin sleeves. 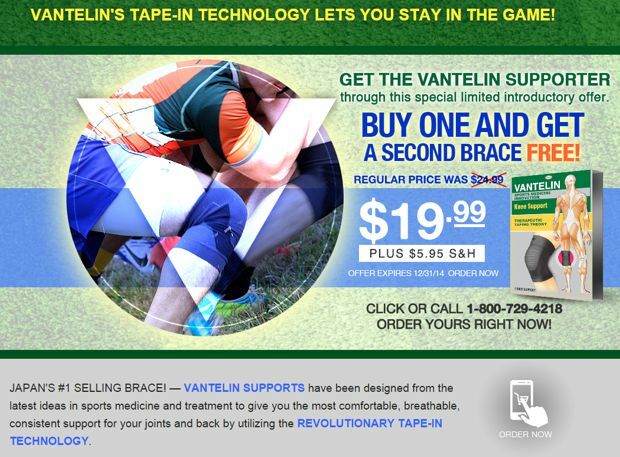 Vantelin Supports are advertised as products which provide the same benefits as athletic tape and compression wear, in the form of a single sleeve. Vantelin Supports are compression sleeves which are said to contain athletic tape sewn into the product. Although this product only appeared in the U.S. market in late 2014, it has apparently been available in Japan for some time. The product’s official website is vantelinsupports.com, which was registered in September 2014. The domain vbrace.com has also been used in advertising. That domain was registered in October 2014. This is vantelinsupports.com, as seen in December 2014. This is vbrace.com, snapped in December 2014. While the vantelinsupports.com website has a more professional design and easier navigation, the more crude-looking vbrace.com has been used in recent advertising. 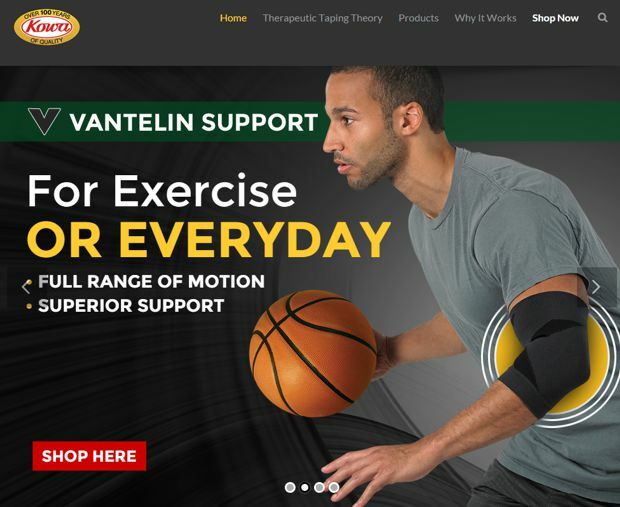 While therapeutic taping theory requires experience, patience and trial and error to apply correctly, Vantelin Supports provide the appropriate amount of resistance in a convenient form in one easy motion. Inspired by the Taping Theory, Vantelin Supports will effectively sustain the movement of joints and muscles by providing the appropriate compression. This also allows tendons and muscles to work in a more cohesive way. The website offers the knee, ankle, elbow, and wrist braces for $19.99 each, plus $5.95 shipping. A back support brace is also available for $39.99. It should be noted that Vantelin braces in Japanese packaging can be found readily on Amazon for as low as $11. Available products include: knee brace, ankle support, elbow, and back support. Knee brace comes in white, yellow, blue, green pink, navy, and black. Vantelin appears to be a combination of two hot athletic products: Kinesio tape, and compression wear. Kinesio tape is most commonly seen as brightly colored strips which many athletes wear to allegedly reduce inflammation, relax and support muscles, and enhance performance. Compression wear is marketed with similar claims, such as improved circulation and support. Tommie Copper is an example of a popular compression wear brand. Although the true benefits of both kinesio tape and compression wear are still hotly debated, Vantelin has incorporated both technologies into a single product which could be well-received by fans of these products. The supports are comfortable, stylish, and offer a free range of motion while continuing to support the target area. What advantage, if any, this product provides over alternatives is not apparent. The primary complaint we have heard about some of the Vantelin supports is that of not staying in place. There are a small number of reviews for the Japanese version on Amazon. Some have noted that the brace is comfortable, while others have said it does not compress as much as they would have liked, and eventually slides down the leg throughout the day. Keep in mind that Japanese-packaged Vantelin supports can be found on Amazon, sometimes for a lower cost than purchasing the U.S. branded versions. If you’ve tried Vantelin supports, please give us your review below. This review has been updated since its original publication in December 2014. I had a knee arthro-scoped about 2 years ago and started using the V-Brace about 1month ago when playing tennis. My knee feels more stable while playing and better after. I wear Medium in all my clothes sizes, but decided to order the small and it seems to work better than I think a medium would for me. Not a good product and their Customer Service is as bad! I just received my knee support sleeves today. had them on all day. I have bad knees from installing flooring and I am 59 years old. My knees hurt so bad I thought what could I lose in ordering them. I got the Tommie Copper knee sleeves for night time. I put them on today and went climbing up and down 17 stairs and another 14 stairs. Done the 17 twice then just went for a walk around a block. I was going at a faster pace than I have been, not running. Only went around once and I didn’t hurt one bit. I know it is my first day but I am happy for now. I may have to get the ankle sleeves next. Will wait a bit longer though. My knee needs more compression for martial arts workouts; however, the V-Brace is comfortable at night for sleeping & fits under clothes, so it provides some relief from knee pain. As noted, could be great for some…for me, just OK. I play tennis 2-3 times a week all year round and enjoy hiking in the mountains. But the arthritis in my right knee constantly gave me a lot of trouble. I tried different brands of knee braces/sleeves over the years. None of them was comfortable or flexible enough to wear for long periods. The Vantelin knee brace has been the only one that is so comfortable I frequently forget that I’m wearing one. It provides enough support yet I can bend my knee without it bunching up on me. Right now this is the only type of knee support that I will use and need. I’m back in the market to buy more because I just lost mine. The price on vbrace.com site has gone up quite a bit since I last ordered mine. So I’m looking into getting them from Amazon.com. The only problem I have is the measurements. The Japanese version says size small is 31-34 cm and the American version says 13-14.5 in. knee circumference. I wonder if the discrepancy in measurements is because the former is for the brace whereas the latter is for the knee. Does anyone know the answer to this?